Unrelated to cars… but I’d just like to share. You can click for an an enlarged version of it. Source is from NASA’s Earth Observatory Newsroom. This photo was taken back on 25th June 2005. I guess the white smog that was previously over the ocean is now right over Malaysia. A thick cloud of smoke pours from forest fires on the Indonesian island of Sumatra. Forest fires are common in Indonesia during the hot, dry months of the dry season, which runs from June to September. Hot, dry weather and winds blowing from the southwest help fires explode in Indonesias forests, and such conditions probably fed the fires seen outlined in red in this image. The winds are also responsible for blanketing parts of Malaysia with smoke. In this image, a white plume of smoke snakes north and east from the fires, moving inland over northern Malaysia. Not only does the dense haze decrease visibility, posing a traffic hazard for both air and ground travel, but the smoke could cause serious health problems. The Moderate Resolution Imaging Spectroradiometer (MODIS) onboard NASAs Terra satellite acquired this image in the morning of June 25, 2005. 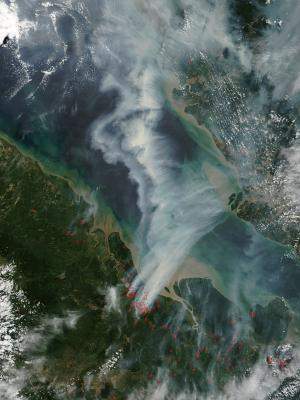 By afternoon, the fires had grown to the point that the narrow Strait of Malacca that separates Malaysia from Sumatra was barely visible. Unfortunately, clouds also partially obscured the view of the region.